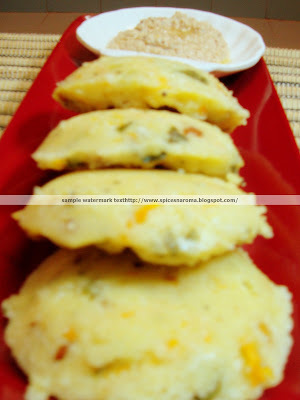 This is yet another favorite South Indian dish of mine. 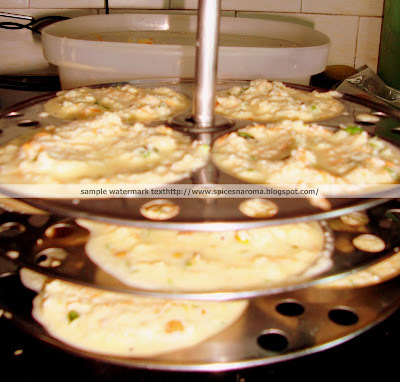 When I visited home more than year later, the very first dish my mom made was Rava Idly. It was so delicious that I nearly had half dozen of them at one go 😉 n few more now n then when I was walking around the house. I noted the recipe from my mom as always and it remained untouched for a long time. So when I went back for my graduation ceremony, I planned to cook it for my roommates. I took a microwaveable idly plates from home; it had a very small idly base and all the idlies looked really small and fat. But never mind we know how desperate a Student life is… any authentic home dish goes through the food pipe really quick despite its look….but to be honest it was really yummy and very much tasted like my mom’s ones. Lightly roasted mustard seeds, channa dal, cashew pieces,ginger and green chillies really added an excellent flavor to the dish. I used desiccated coconut but I am sure the fresh ones will make it taste really better. My friends really loved it and as always I was made to cook it in the microwave, each time I finish with one set, my friends would have finished the previous one..I ended up doing it the whole night!!!! Never mind, cooking for loved ones is so much fun. 😉 This is an excellent replacement dish when you have the mood to have idlies n have no time to soak n grind!!!! Heat ghee/oil in a pan; add mustard seeds, channa dal sauté till they turn golden brown. Add the green chillies, curry leaves and ginger. Now add the rava and cook on low flame for about 3-5min. Remove from heat and keep aside. 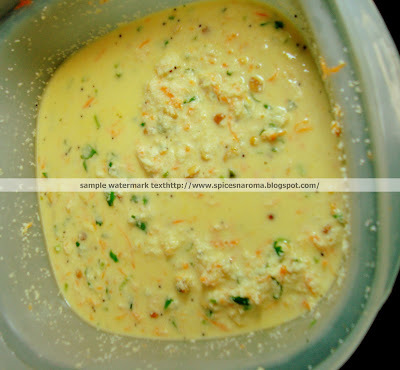 Take a large bowl, add the carrots, peas, coriander leaves, coconut, yogurt, water, salt, cashewnuts, baking soda and the above cooled mixture and mix them thoroughly. Let this sit for minimum 15-30min. Grease the idly plates with oil/ghee. Pour the rava batter. Don’t overload the batter in the plates. Steam cook them for 10-15minutes. Turn of the heat and let it sit for 5min and remove. If using a microwave, then take a large bowl fill about 3-4 cups water in them and then place the microwaveable idly plates. Cook for 10-15min on high. Serve hot with chutney/sambhar. Note: For even more better ones, let the batter ferment for about 15-30minutes before you start to steam them. I couldn’t let it sit as we guys were really hungry. Skip it, if you don’t have time.